Got a big, casual gathering coming up? Here’s a wonderful soft-shell taco recipe that’s big enough to serve a crowd. 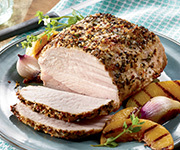 The pork is marinated with orange juice, garlic and a special seasoning, slow-cooked in the oven until fork-tender, and then finished on the grill for wood-smoked savor. Pile the meat into corn tortillas with pickled onions and keep the salsa coming. 1. Combine orange juice, vinegar, achiote paste and garlic and well rub the mixture all over meat. Let marinate up to 24 hours, turning occasionally. 2. Heat oven to 300 degrees. Line a large roasting pan with a triple layer of aluminum, enough to overlap the sides of the pan. Arrange pork on foil; pour excess marinade over it and seal well by wrapping foil tightly around meat. Cover with lid and roast 2–4 hours, unwrapping it once or twice to turn the meat (but sealing it tightly again). Cook until meat is very tender. It may take a long time, so don't worry. 3. Let pork cool in its juices while you build a wood (or charcoal) fire in a kettle-type outdoor grill. When the fire is ready (medium-low embers), move the logs or coals to the sides of the grill. Place a grill rack on the grill and carefully transfer the meat to the center of the rack. Cover the grill and close all the vents. Let the meat smoke for 1/2 hour. 4. Remove the meat to a cutting board and let it stand until it's cool enough to handle. Shred the meat (a meat fork works well). Spoon off fat from pan juices. Combine pan juices and shredded meat with just enough salsa to keep the meat moist. To serve: Warm the tortillas and fill them with meat and pickled onions. Serve immediately and pass the salsa. Achiote paste is called for in this recipe. It is a deep-red Mexican seasoning made from annatto seeds and other spices. You can find it in Latino grocery stores or order it online from spice companies.